Global Supply Chain Insights: New blog post and more! New blog post and more! I must confess, I am so glad this week is over. Last weekend was tough from a personal perspective and the week began on a very sad note - our beloved Allie Cat passed away. She was a part of our family for only a few months and had developed diabetes, fluid build-up in the lungs and several other ailments that the doctor suspected all added up to cancer. 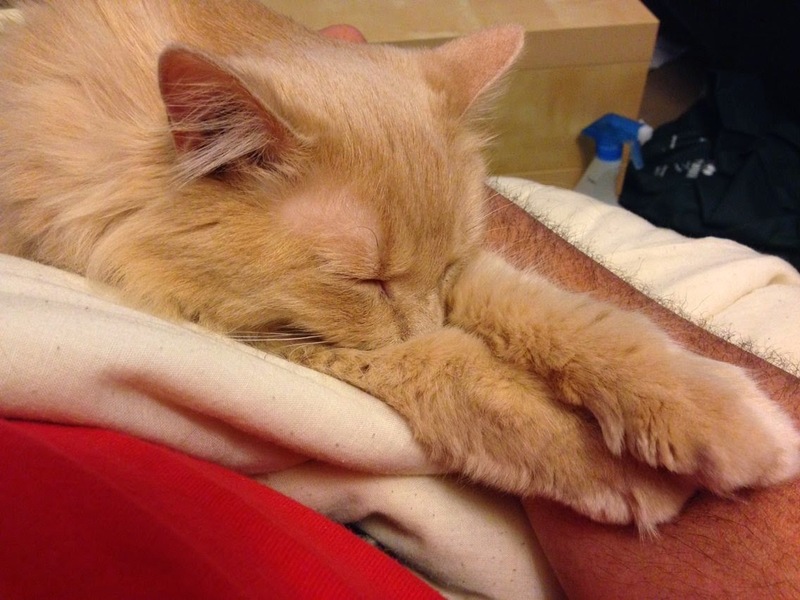 This is Allie in her favorite place, on Chris' lap, asleep. Work-wise the freight forwarding report is coming along nicely and should be published the end of this month. Also this week the Global Logistics Monitor was completed. Folks that subscribe to our GSCI portal will now have access to these monthly updates and analysis of the global market starting with this one. I've already received some good feedback on this one and will use that tailor it to fit the needs of folks needing market analysis to benchmark their companies against and for investor relations presentations. Yes, after what, 3 weeks now? I finally wrote a new blog post. This one was interesting. a specialized PR firm in California found out my fascination with start-up companies and sent me a case study featuring JAS Forwarding and Zoom. To be honest, I wasn't sure about this but after some thought, the simplicity of the solution and the need for such a solution for communications and collaboration around the world for freight forwarders hit me. So, the post is available here in case you're interested in reading more. Next week will be kind of a short one for me. I will be focused on the freight forwarding report and then Thursday and Friday Chris and I are heading to the Smoky Mountains for some long overdue hiking. Don't worry, I'll still continue to check emails and phone while away from the desk but probably just in the evenings. Enjoy the weekend. I hope to catch the World Cup this weekend. Apologies to my German friends but since I am responsible for the Americas region for Ti, I will be pulling for Argentina this time around. But honestly, I am just hoping for a really good game regardless of the outcome! Take care and thanks again for reading the blog!